Follow Us on Twitter for Discounts and Freebies! The start of college is a stressful time and it can keep being stressful if you don’t take the time to sit down and think about the must-have’s to make your life easier. 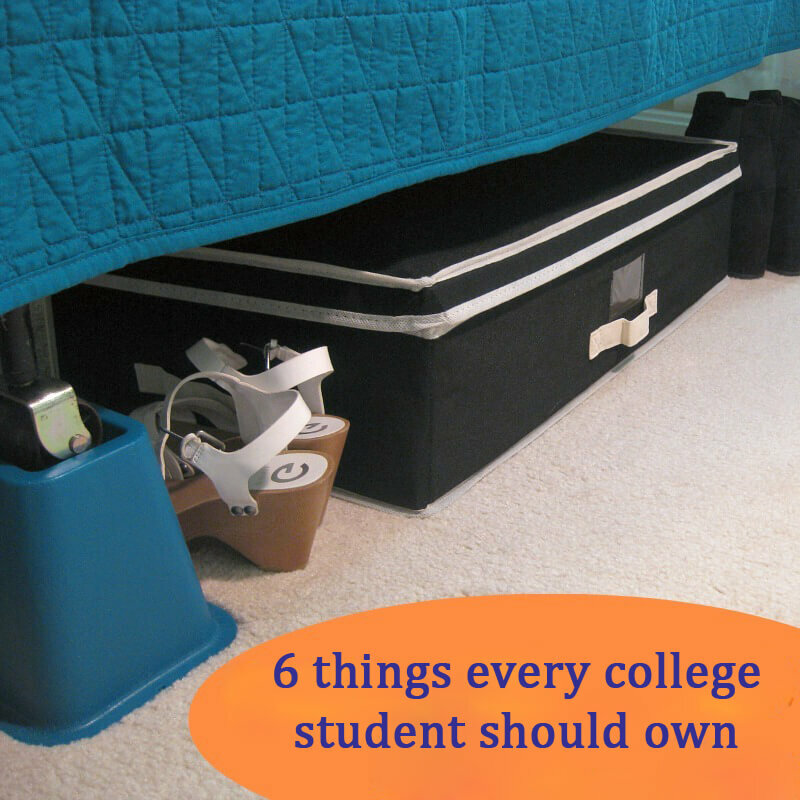 Here is a list of 6 simple and no-brainer things that will significantly ease your college lifestyle. We do go to college to study, right? So might as well make it productive. Stock up on pencils, pens, notebooks and don’t forget to also have a ruler, scissors, a stapler and some glue around. You never know when you’ll remember that you have that creative project due tomorrow. Why not get a desk organizer while you’re at it? A good study station is the start to good grades…maybe. Stuff accumulates with breaking speed. Before you know it, you’ll have a bunch of textbooks, a heap of printouts and a stack of graded papers with nowhere to put them. Get organized to not feel cramped in your small-as-it-is room. In addition, try going up and putting bins on top of each other. Don’t let all that room up there go to waste or the room down there. Yes, under-bed storage is a savior for all those clothes you won’t be using in the nearest month or two. Now this is a no-brainer. A huge PC is, of course, great to have… at home where you have plenty of room. But in college, you need a laptop for when you’re running between classes or just decide that you want to study on the bed. It is more likely, though, that you’ll be watching a movie in the end instead of studying. But why not? College students get to relax sometimes too! Try getting one of those 3-in-1 printers, so that you can print, copy and scan everything you need. This won’t only save you time, but it will save you money as well. A lot! Once you get to printing those big research papers, you’ll see just how much you are saving. Don’t forget the ink for your printer! Individual cartridges are expensive, especially for a college budget. Try buying cartridges in bulk and not in the campus book store. You’ll be grateful you have a spare when you suddenly run out of ink in the middle of printing the 30-page paper due in an hour. If you’re not used to load music, people talking and dancing while you’re trying to fall asleep, you will need ear plugs. No matter how great your roommate might be, hallways are also a great place to chill. It’s awesome when you’re out there partying with everyone, but when you finally found time for some shut-eye, you want to get those hours of sleep. This is something your parents had back home and you now have to get for yourself as well. It need not have anything serious, but a stash of painkillers, plasters, throat sweets and cough medicine has never been useless in a college dorm. Trust me on this. Now that you’ve got these six things checked off, stop procrastinating and get back to work!